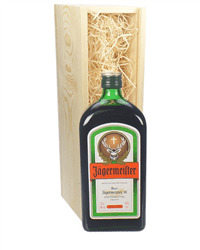 Jagermeister has been around since 1878 and we have a great selection of Jagermeister gifts to choose from. However, Jagermeister has only really hit the big time over the past 10 years or so, probably since the development of Red Bull to be honest. Produced from a selection of 56 botanicals, this herbal liqueur is then left in oak barrels to refine and create that complex and balanced flavour - before you generally use it as the base for your Jager Bomb!